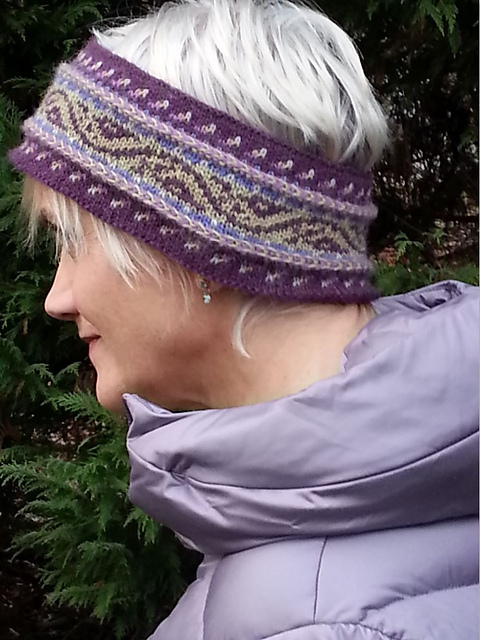 I Spy a Crocus, a knitting pattern for a ladies’ hat. After the brutal winter we’ve endured, I got up out of bed this past Saturday morning – our last weekend in March – hoping that maybe, finally, we’d have a decent, spring-like weekend. I had this silly notion that, “Oh, wouldn’t it be nice, to spy a sweet little crocus peeking out at me from somewhere in the yard?” Rather, overnight, my greening yard became buried under yet another blanket of ice and snow. Fortunately, when Mother Nature disappoints, all we have to do is grab our knitting needles! It’s true -necessity really IS the mother of invention. And, boy, did I ever need to see some flowers! Hence, my new “I Spy a Crocus” hat. It was a quick, easy, stranded knit in Dale Garn’s new Cotinga, a heavenly blend of 70% merino / 30% alpaca. Wonderful, wonderful stuff! You’ll need three different-colored 50g balls of Cotinga, or your favorite, soft, compressible worsted weight yarn. UPDATE: While Dale yarns are no longer available in North American, you still have hundreds of options for knitting your own version of “I Spy a Crocus” out of your favorite worsted weight yarns. Here’s a link to the $5 knitting pattern PDF on my online shop, MaryAnnStephens.com and here’s a link to the PDF in my Ravelry store. This entry was posted in Fair Isle Knitting, Knitting, Mary Ann's Designs, Norwegian Knitting and tagged alpaca, crocus, fair isle, flower, hat, knit, Knitting, ladies, merino, norwegian, pretty, soft, yarn. Bookmark the permalink.